Water is fundamental to all life on Earth. While it may be easy for many of us to take the availability of water for granted, growing demands on the world's water resources highlight the importance of water to everyday life. Access to clean water is a growing political issue around the world. In 1977, basic survival needs were stressed at the Mar del Plata conference, a major international effort to address world water problems organized by the United Nations. The issue of the right to basic water needs was illustrated by the statement that "all people . . . have the right to have access to drinking water in quantities and of a quality equal to their basic needs." As world populations grow, societies are challenged to provide clean water and sanitation services. Of significant concern is meeting basic human and ecological needs for water, vital for survival and good health. Many societies struggle to allocate sufficient resources to meet those needs for all of their people. War and international conflicts can worsen water-supply situations in countries already faced with water scarcity. Human survival can be threatened not only by weapons, disease, and starvation, but also by the lack of water. 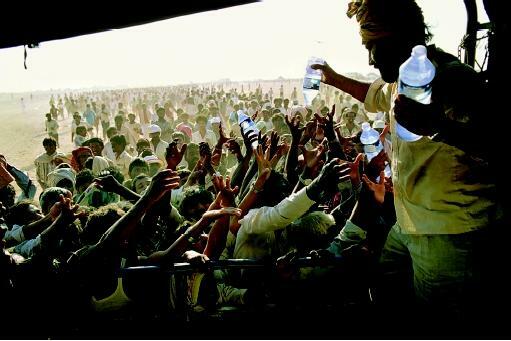 Here a relief worker distributes bottled water to refugees during the Persian Gulf War. be restored. The minimum water requirement for replacement purposes, for an "average" person, has been estimated to be approximately 3 liters (3.2 quarts) per day, given average temperate climate conditions. In addition to drinking requirements, water is traditionally used for sanitation purposes for the disposal of human waste. Effective waste disposal has many health benefits as it serves to control the spread of disease. Humans also have basic hygiene needs for personal washing and bathing, and for food preparation. These hygiene-related uses of water also have many health benefits. Drinking, sanitation, and hygiene needs constitute the basic human survival needs for water. These minimum needs total about 50 liters (13.2 gallons) per person per day. In comparison, the average American uses well over ten times that amount. Fifty liters per person per day maintains a person's water balance and provides benefits vital for human health. In 2000, it was reported that 55 countries, with a combined population of over 1 billion, average below this basic level. Access to safe and reliable local water supplies is a major challenge in many communities in developing countries. Without the benefit of piped-in supplies, many people must devote part of their day to securing water for their daily needs. 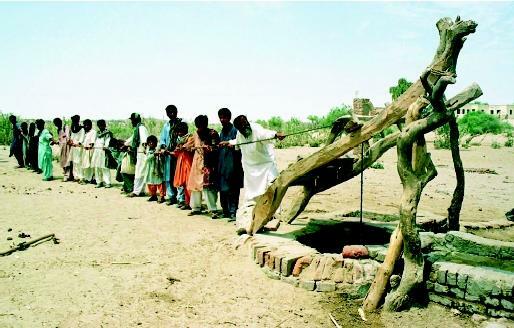 In this photograph, Pakistani villagers pull drinking water from a 122-meter (400-foot) well. have spurred considerations over a human right to water. Typically, one thinks of human rights as general freedoms and a response to violence, as outlined in the 1948 Universal Declaration of Human Rights. If the United Nations recognized water as a fundamental human right, countries would have a duty to protect and promote these rights: then international law, declarations, and state practice could support the provision of water services to all. Many view universal access to basic water services as a fundamental condition for human and economic development. The overall lack of access existing around the world today is a failure of modern economic development efforts. The World Bank estimates that more than 1 billion people lack access to safe drinking water and over 3 billion live without access to adequate sanitation systems needed to reduce harmful water-related diseases. In November 2002, the United Nations Committee on Economic, Cultural and Social Rights issued a statement declaring access to water a human right. This recognition reflects the importance of water to human life and the ongoing challenges societies face in providing water for all their citizens. SEE ALSO Developing Countries, Issues in ; Human Health and Water. Gleick, P. H. 1996. "Basic Water Requirements for Human Activities: Meeting Basic Needs." Water International. 21:83–92. United Nations. 1948. Universal Declaration of Human Rights (Resolution 271).Available online at <http://www.unhchr.ch/udhr> . United Nations. 1967. Report of the United Nations Water Conference, Mar delPlata. New York: United Nations Publications. World Bank. 1993. Water Resources Management: A Water Policy Paper. Washington, D.C.: The World Bank.